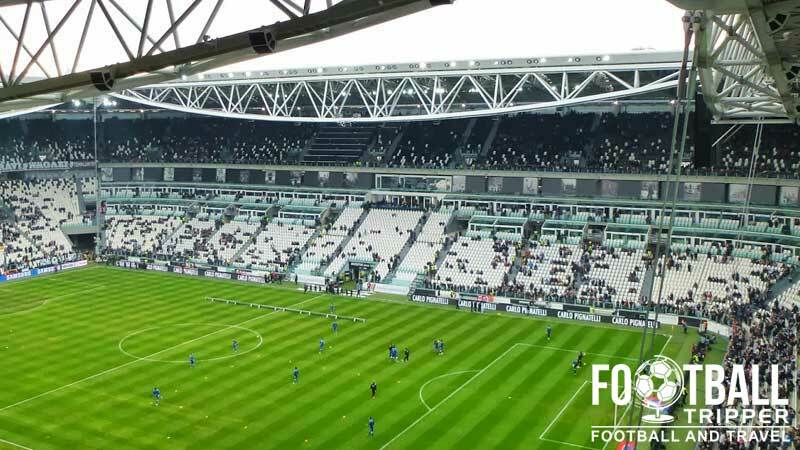 Juventus Arena or the Allianz Stadium for sponsorship reasons first opened on 8th September 2011 and since then it has proven to be a fortress for The Old Lady. Constructed on the site of the former Stadio Delle Alpi very much in the English mould, it is rightly so the envy of opposition fans across the peninsula. The Juventus Stadium first opened on 8th September 2011 with the opening ceremony and inaugural match held against the oldest professional football club Notts County, who provided the inspiration for The Old Lady’s famous black and white stripes. Three days later the first Serie A match was held against Parma with Stephan Lichsteiner scoring the first goal during the 17th minute. Previously the club had played their home matches at the municipally owned Stadio delle Alpi which was constructed for Italia 90. The stadium proved to be incredibly unpopular with fans due to the athletics track and attracted on average less than third of the stadium’s total 67,000 capacity. In 2003 Juventus negotiated a deal to purchase the stadium from the council and temporarily moved into the newly renovated Stadio Olimpico. In November 2008 the club revealed that they intended to demolish the Delle Alpi and create a brand stadium on the same site, at a cost of €100 million. Two years later the new stadium was completed becoming the first self-financed and club owned stadium in Italy. 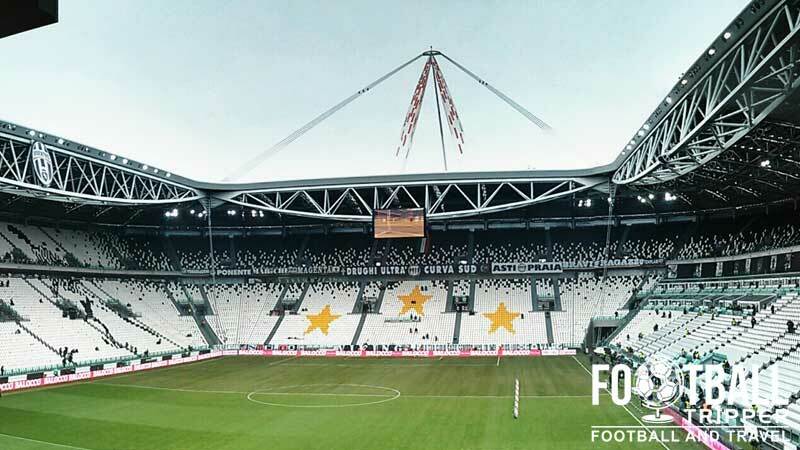 With a new precedent set for Italian Football there are hopes that Juventus’ Stadium can inspire other teams to follow the English and German model of purpose-built stadiums. During the 2013/2014 season, Juventus Stadium hosted the Europa League final between Sevilla and Benfica, with the Spaniards winning 4-2 on penalties. The Old Lady had a chance to play the final in their own back yard but narrowly lost out in the semi-finals to the Portuguese giants. From the 1st July 2017 Juventus announced that the ground would officially be known as the Allianz Stadium of Turin until 2023 – at least for the next six seasons. 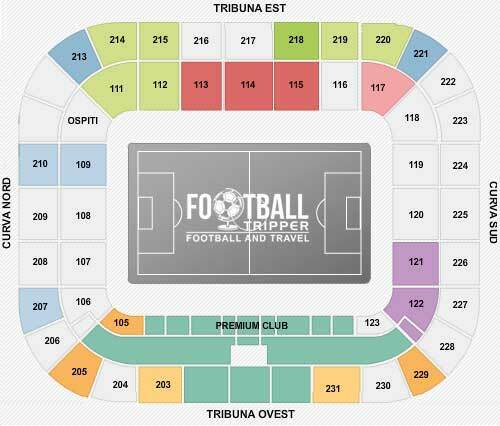 Juventus Arena can be divided into four parts or so: Curva Nord, Tribuna Est, Curva Sud and Tribuna Ovest. Away fans are housed in a small corner section within the north-east stand which is separated from the home supporters by perspex screens. The standard ticket allocation for the travelling supporters is usually 2,000 however it’s only really full for big Champions League matches and when Juventus Serie A rivals come to town. The relatively low roof helps the acoustics of the ground greatly, with noise exchanged between the away section and the opposite ultra end, the curva sud. Views of the pitch are generally great although the cable support and barrier to the pitch can restrict the minority of sight lines. Juventus Arena sits at the heart of a wider commercial area known as the Area 12 shopping centre. As well as containing over 60 shops, and several restaurants from sit-down Italians to fast food, Area 12 also contains two bars where you can grab a drink from before kick-off. Within the city centre there are a number of watering holes where you can drink before and after the match with the map containing some of the more popular pubs amongst football fans. Towards the north-east quadrant of the ground on Via Torino Druento there is a franchise of the omnipresent McDonald’s burger chain which predictably does a roaring trade on matchdays. Besides this recognisable name there is a scattering of independently run pizza places dotted around the ground including the likes of Restorante Mucca Pazza Venaria, La Piazzetta and Pizzeria O’Sole Mio. Located within the Area 12 shopping centre towards the north-eastern side of the stadium, The Juventus Store is the largest football club shop in Italy spanning over 550 metres of Bianconeri bliss. It really does sell anything you could ever want, and besides the Juventus Online Store, it really is the best place to purchase items belonging to the Old Lady! There are also two stores located at the entrances to the north and south stand which are open on matchdays, as well as two other stores within the city centre. 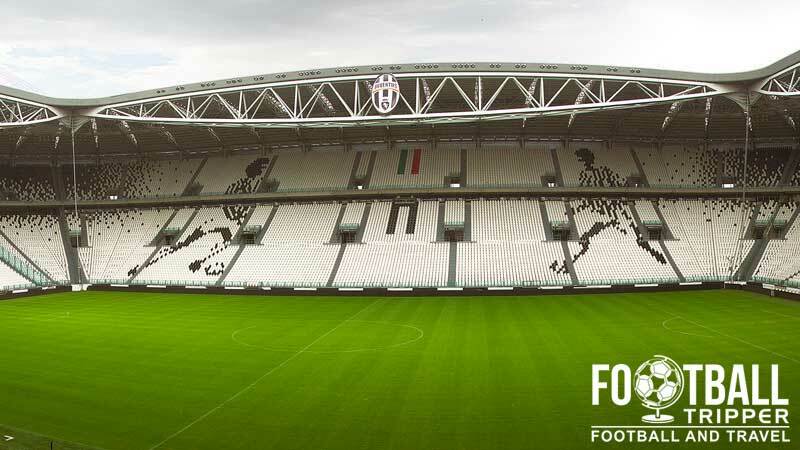 Tours of the Juventus Stadium last around 70 minutes and are available to book as combined package with a trip to the museum which is the perfect way to end your behind the scenes experience. Tickets can either be purchased online via List Ticket or from the Museum itself, and generally run on every day of the week with the exception of Tuesdays. 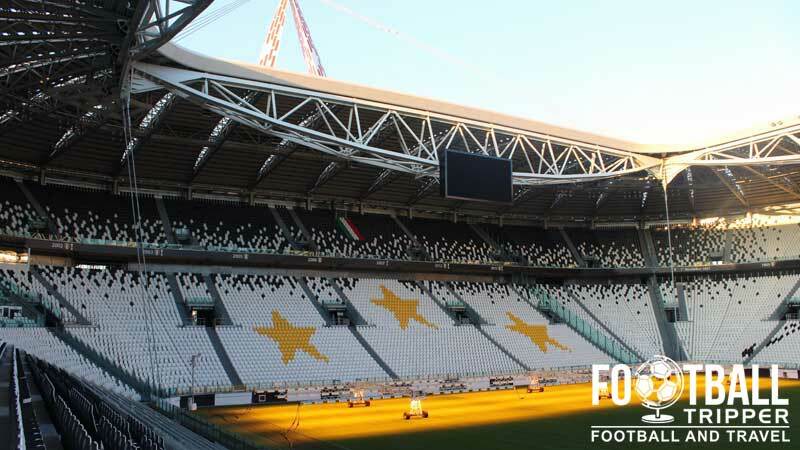 Tickets to see Juventus play at home can be purchased online, and around from various points around the city and stadium in the weeks leading up to the match. Juventus’ Stadium is located out of town approximately 6 km northwest of Turin’s‘ historical city centre towards the western foot of the Alps. The easiest way to travel to Juventus Stadium on matchdays is via a mixture of tram and bus services which are especially put on for fans heading to the ground. If you are planning on catching a taxi from the city centre expect to pay around €20 euros, but be warned there is no taxi rank at the ground after the match so you may have to prearrange someone to pick you up if this is the case. There’s space for up to 4,000 vehicles at the onsite carpark which makes travelling by car extremely convenient. Passes are sold by the club for around €10 euros per match, with premium parking spaces costing around €20 euros. You can book in advance and see a map by visiting this page on the official website. Turin is served by two train stations: Stazioni Torino Porta Nuova which is the main railway station which is the third busiest in Italy, and Porta Susa which has a number of regional routes as well as services to France which ends in Paris. Some fans can get confused because sometimes other websites refer to the “Tram” as a “Bus”. The tracks should give you a clue as to what it is! Once you have entered one of the many metro stations located throughout the city you need to make your way to the Bernini stop which is located on Metro Line 1. For most central locations that means you want to head northwards in the direction of Fermi. Once you have arrived at Bernini Metro station exit and you will see a large number of supporters catching the number 9 trams which are clearly marked for the stadium. They typical run for a few hours before and after kick-off. During the week you can also get to the ground by catching buses 62, 72, 75 and VE1 which all depart from the city centre. Luckily there’s only major airport in Turin, meaning there’s no danger you can book with the ‘wrong’ airport and end up needing a 4 hour coach ride from just outside Genoa! The name of the airport is Turin Caselle Airport, and it is served by a variety of budget airline carriers from around Europe. Once you have landed you can catch a train service from Dora Station for a few euros which will take you to the city centre. Turin Caselle is located around 14km north-west of the central business district. Being on the outskirts of Turin you have the choice whether to stay near the stadium or near the city centre. Two hotels very nearby are the Hotel Master and the Hotel Galant, but if you want to be closer to the heart of Turin then you’ll be spoilt for choice with hotels a variety of hotels for all price ranges and locations.